On July 5, 2017, NASA's Solar Dynamics Observatory watched an active region—an area of intense and complex magnetic fields—rotate into view on the Sun. The satellite continued to track the region as it grew and eventually rotated across the Sun and out of view on July 17. During its 13-day trip across the face of the Sun, the active region—dubbed AR12665—put on a show for NASA's Sun-watching satellites, producing several solar flares, a coronal mass ejection and a solar energetic particle event. Watch the video below to learn how NASA's satellites tracked the sunspot over the course of these two weeks. Such sunspots are a common occurrence on the Sun, but less frequent at the moment, as the Sun is moving steadily toward a period of lower solar activity called solar minimum—a regular occurrence during its approximately 11-year cycle. Scientists track such spots because they can help provide information about the Sun's inner workings. Space weather centers, such as NOAA's Space Weather Prediction Center, also monitor these spots to provide advance warning, if needed, of the radiation bursts being sent toward Earth, which can impact our satellites and radio communications. On July 9, a medium-sized flare burst from the sunspot, peaking at 11:18 a.m. EDT. Solar flares are explosions on the Sun that send energy, light and high-speed particles out into space—much like how earthquakes have a Richter scale to describe their strength, solar flares are also categorized according to their intensity. This flare was categorized as an M1. M-class flares are a tenth the size of the most intense flares, the X-class flares. The number provides more information about its strength: An M2 is twice as intense as an M1, an M3 is three times as intense and so on. Days later, on July 14, a second medium-sized, M2 flare erupted from the Sun. The second flare was long-lived, peaking at 10:09 a.m. EDT and lasting over two hours. This was accompanied by another kind of solar explosion called a coronal mass ejection, or CME. 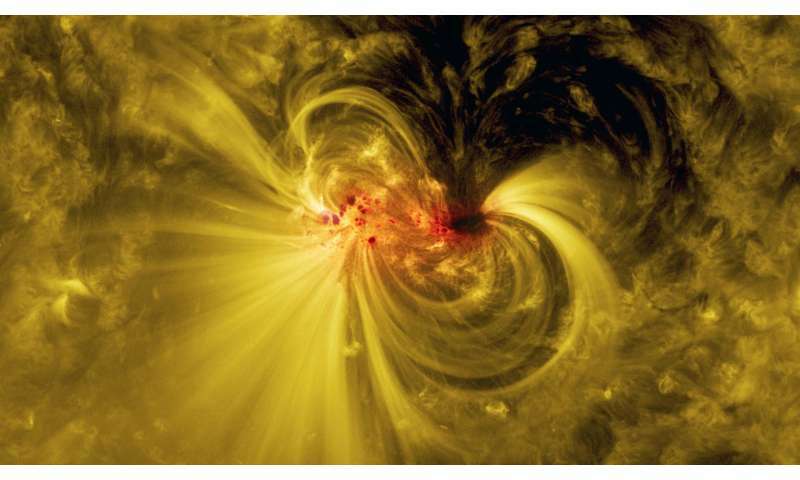 Solar flares are often associated with CMEs—giant clouds of solar material and energy. NASA's Solar and Heliospheric Observatory, or SOHO, saw the CME at 9:36 a.m. EDT leaving the Sun at speeds of 620 miles per second and eventually slowing to 466 miles per second. Following the CME, the turbulent active region also emitted a flurry of high-speed protons, known as a solar energetic particle event, at 12:45 p.m. EDT. Research scientists at the Community Coordinated Modeling Center—located at NASA's Goddard Space Flight Center in Greenbelt, Maryland—used these spacecraft observations as input for their simulations of space weather throughout the solar system. Using a model called ENLIL, they are able to map out and predict whether the solar storm will impact our instruments and spacecraft, and send alerts to NASA mission operators if necessary. By the time the CME made contact with Earth's magnetic field on July 16, the sunspot's journey across the Sun was almost complete. As for the solar storm, it took this massive cloud of solar material two days to travel 93 million miles to Earth, where it caused charged particles to stream down Earth's magnetic poles, sparking enhanced aurora.